Kathy came to my “birthday party” (a recipe contest I started for the German blog) and she came up with this great cupcake recipe. Mix butter with sugar, then add one egg at a time. Add semolina, flour and milk to the mixture to finish the dough. Prepare the muffin tray. Pour in the dough until the muffin forms are half-full. 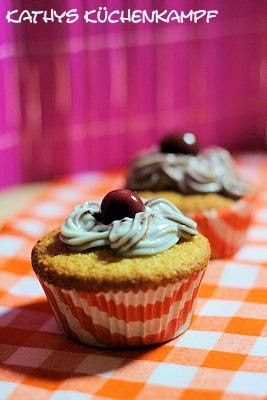 Add a cherry as “surprise” to each muffin. Now fill up the muffin forms, but not completely – about 2/3 of each form should be filled with dough. Bake at 180°C for 15 to 20 minutes. By sticking in a knife carefully you can test if the cupcakes are already done. Mix all ingredients for the topping. 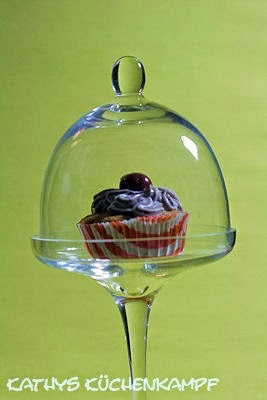 Garnish the cupcakes with the topping by using a pastry tube. Place a cherry on top. Enjoy. Enjoy & thank you, Kathy!